Munsiyari is The Name Of A Town And A Tehsil In The Pithoragarh District In The Hill-state Of Uttarakhand, India. Munsiyari, The Center As Well As The Gateway Of Johar Region is Situated 128 Km From Pithoragarh At An Elevation Of 2298 meters And Is Snuggled In The Folds Of Snow Clad Mountains. 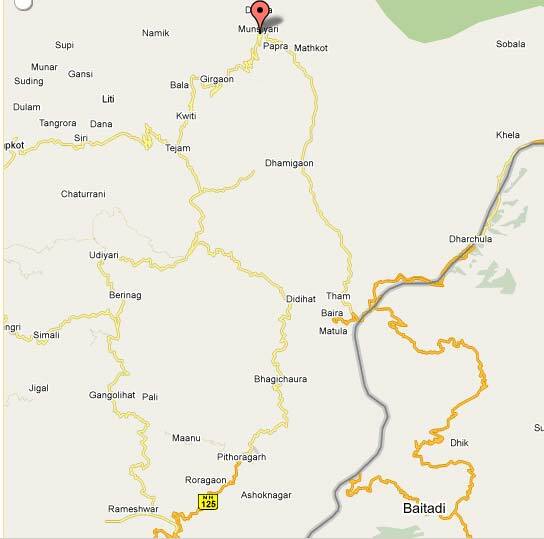 Munsiyari Is 624 kms From Delhi And Around 300 kms From Nainital And Almora To Munsiyari Is 192 kms. Munsiyari's Name Refers To A 'Place With Snow'. Situated On The Banks Of Goriganga River, It Is A Fast Growing Tourist Destination, And Mountaineers, Glacier Enthusiasts, High Altitude Trekkers And Nature Lovers Commonly Use It As Their Hub Or Base Camp. Munsiyari Also Falls On The Ancient Salt Route From Tibet And Is At The Entrance Of The Johar Valley, Which Extends Along The Path Of The Goriganga River To Its Source At The Milam Glacier. It Is Inhabited Mainly By The Shauka People. The Town Is Surrounded By Snow Capped Peaks, With A Key Attraction Being The Trekking Route To Khalia Top. Munsiyari is A Paradise For The Nature Lover. The Forests That Clothe The Lower Reaches Are Stunningly Attractive With Colorful Mountain Vegetation That Includes Besides Others, Rhododendrons. This Dense Himalayan Forest Is Home To A Variety Of Birds And Animals Such As Whistling Thrush, Wagtail And Hawk Cuckoo, Falcon And Serpent Eagle, And Leopard, Mountain Bear And The Musk Deer. It Is Said That The Pandavas Had Set Out For Their Final Journey To Heaven From Munsiyari. Munsiyari Also Falls On The Ancient Salt Route From Tibet And Is At The Entrance Of The Johar Valley, Which Extends Along The Path Of The Goriganga River To Its Source At The Milam Glacier. They Led Semi-nomadic Lives Actively Engaged In Trade With Tibet Across The Difficult Himalayan Passes. It Took Them 20-25 Days To Reach Munsiyari From Tibet From Where They Carried Back Mainly Salt. Salt Consumed In The Entire Himalayan Region Came From Tibet Early Days. It Is Inhabited Mainly By The Shauka People (referred To As Bhotiya By The Non-Shaukas), Who Are Its Original Natives. The Shauka People Are The Main Inhabitants Of This Place. People In Munsiyari Worship Goddess Nanda Devi. The Locals Were Suddenly Found Without A Viable Livelihood When The Border With Tibet Was Sealed In 1962 And The Trade Stopped Completely. Agriculture Has Never Been Too Developed Here On Account Of The Unfavourable Climate. Most Of Them Were Therefore Forced To Migrate. The Villages Of Milam, Burfu Etc., To The East Of Munsyari, Are Largely Deserted Today. Places Of Tourist Interest In Munsiyari :- Munsiyari Is The Base Station For Treks To Millam Glaciers, Ralam And Namik Glaciers. It Lies At The Base Of The Great Himalayan Mountain Range, At An Elevation Of About 2,200 M (7,200 Ft), And Is A Starting Point Of Various Treks Into The Interior Of The Range. Khaliya Top : High Altitude Gentle Slope Meadows Located At A Distance Of 7 kms, From Munsiyari. Ideal Site For Skiing And Adventure Sports. Betuli Dhar Is About 5 kms, From Munsiyari. Madkot 22 kms, From Munsiyari. Madkot Has Hot Water Springs Which Cures Rheumatism, Arthritic Pains, Skin Eruptions Etc. Birthi Fall 19 kms, From Tejam On The Munsiyari Motor Road. Birthi Falls Are Quite Spectacular For Its Waterfalls. Wayside Amenities And Fast Food Centre Is Available. Kalamuni Pass is Situated Near Munsiyari In Pithoragarh District. This Region Is Surrounded By Oak And Birch Forests. It Provides An Enchanting View Of Panchchuli Peaks. Kalamuni Temple And Kali Temple Are Located Here. Other Nearby Tourist Destinations Include Kalamuni Top, Thamari Kund, Birthi Falls, Maheshwari Kund, Khalia Top, Betulidhar, Milam Glacier, Namik Glacier And Ralam Glacier. Munsiyari Is A Picturesque Destination Affording Enchanting Views Throughout The Year. The Best Time To Visit Munsiyari Is From April To June And From Mid September To October End. Summers In Munsiyari: The Weather Of Munsiyari Remains Salubrious During Summers And You Can See Unobstructed Views Of The Himalayas. Munsiyari Remains Pleasant During Summers And Light Woollens Are Required. It Is Probably The Best Time To Visit Munsiyari. Till Recently, Munsiyari Was A Restricted Area In The Himalayan Inner Line, Wedged In Between The Borders Of India, China And Nepal. Restrictions Have Now Eased, Placing Munsiyari On The Trekking Map Of The Kumaon Hills. From Munsiyari, There Is A Gentle 11 Km Trail Which Extends To The Famous Kalika Pass (2700 Meters). It Is Here Where A Small Shakti Temple Is Situated Amidst Dark Pines. A More Exhausting Trail Leads Via The Matkot (12 km) Village To The Glaciers Of The Panchuali Group, To The Alpine Meadows Of Chiplakot Bugyal (30 km), Dotted With Tiny Lakes, And Even Up To The Milam Glacier And Johar Valley. Flors Includes Pine, Oaks, Deodar, Cypress, Spruce, Morcilla, Rhododendrons, Some Rare Herbs Etc. While The Fauna Includes Panthers, Leopards, Musk Deer, Mountain Bears, Whistling Thrush, Wagtails, Finches, Cuckoo, Colourful Cuckoo, Hawk, Wild Hens, Lammergier, Teetar Pheasants, Monal, Eagle, Falcon Etc. Munsiyari - Lilam - 12 Kms; Lilam - Bagudiar - 19 Kms; Bagudiar - Rilkote - 15 Kms; Rilkote - Milam - 14 Kms; Milam - Milam Glacier - 5 Kms Munsyari - Lilam - Patan Gaon, 15 Kms; Patan Gaon - Saba Udiar 15 Kms; Saba Udiar - Ralam, 15 Kms Munsyari - Jimighat, 10kms; Jimighat - Jimian, 8 Kms; Jimian - Namik 25 Kms. Munsiyari Is Located At A Distance Of 650 Kms From Delhi And 260 Kms From Kathgodam Railway Station, One Can Avail Taxies From Delhi & Kathgodam For Munsiyari, One Small Hill Airstrip Is Located At Naini Saini In Pithoragarh (130 Kms From Munsiyari), One Can Have A Night Stay At Nainital (310 Kms), Distance From Nainital To Munsiyari Is 290 Kms, And Roads Are Decent And One Can Full Their Diesel / Petrol Tanks At Almora / Bageshwar. Since Munsiyari Is The End Of The Road, Few Buses Come This Way. Bus Services Are Thin Except A Daily Service To Almora And Pithoragarh Respectively. People Mostly Arrive Here On Shared Jeeps; One Needs To Change At Thal For The Last Four Hours Of Journey. Munsiyari - Hill Station Has A Pleasant Climate For Many Months Of The Year. However It Is Advisable To Avoid Visiting During The Monsoon Season As The Conditions Can Be Wet And Activities Such As Trekking Will Not Be Possible. Summers Are Comfortable For The Most Part. Winters Are Cold And Woolens Are Required While Travelling During This Season. The Best Time To Visit The Place Is From March – June And September And October. Summer Season In Munsiyari :- During The Months From March To June. The Maximum Temperature That You Can Expect During The Summer Is Around Summer 20 °C To 27 °C. Monsoon Season In Munsiyari :- Monsoon Season Is From July To September And During This Time Most Activities Are Suspended Due To The Heavy Blast Of Rains. Rainfall Is Highest In The Month Of August. During The Month Of October And November The Conditions Are Pleasant And Temperate. Winter Season In Munsiyari :- Winter Season Can Be Cold In The Town And The Temperatures Can Be Expected To Plummet To Around -3°C. The Barometer Rises Up To A Maximum Of 15°C During The Winter Months. Heavy Wollen Clothing Is Essential During This Period. Nainital Tourism provides Pickup & Drop Facility From Delhi - Kathgodam To Munsiyari Or Anywhere In Uttarakhand.